Florian Tristan Mariano Thauvin (French pronunciation: ​[flɔʁjɑ̃ tovɛ̃]; born 26 January 1993) is a French professional footballer who plays as a winger for Olympique de Marseille and the France national team. He made his professional debut for Grenoble in 2011, moving on to Bastia where he won the Ligue 2 title in his first season and being named Young Player of the Year a year later. He then moved to Olympique de Marseille for €15 million, going on to make over 200 appearances and 50 goals across two spells at the team, with a brief time at Newcastle United of the Premier League inbetween. Thauvin earned 30 caps and scored 14 goals for France from under-18 to under-21 level, winning the 2013 FIFA U-20 World Cup. He made his senior debut in June 2017 and was part of their squad that won the 2018 FIFA World Cup. Born in Orléans, Thauvin played for youth teams at Ingre, Saint-Jean-de-la-Ruelle, Orléans, and Grenoble before rising through the ranks at the latter, and drawing the interest of larger clubs. He made his first team debut for Grenoble on 11 March 2011 in a 1–1 Ligue 2 away draw against Vannes. Grenoble was relegated to the CFA 2 after its liquidation in July 2011. On 19 July 2011, Thauvin departed the club and signed his first professional contract with Corsican side Bastia. On 28 October 2012, he scored his first goal for Bastia in a 3–1 victory over Bordeaux. He helped Bastia to Ligue 2 title triumph in 2012. On 29 January 2013, Thauvin signed a four-and-a-half-year deal with Ligue 1 club Lille for a reported fee of €3.5 million. As part of the deal, he was immediately sent back to Bastia on a six-month loan deal, keeping him at the top-flight Corsican club until the end of the 2012–13 season. Following his impressive displays that season, Thauvin was named the Ligue 1 Young Player of the Year. On 3 September 2013, after weeks of drawn-out negotiations and without making single appearance for Lille, Thauvin signed a five-year deal with Olympique de Marseille. The 20-year-old had been absent from training due to disputes over an improved contract, and forced a move to the Stade Velodrome, eventually signing for €15 million including bonuses. On 4 January 2015, Thauvin was the only Marseille player to miss in the penalty shootout as they were eliminated from the Coupe de France last 64 by fourth-tier former club Grenoble. Thauvin made 81 appearances over two seasons, scoring 15 goals. On 19 August 2015, Thauvin joined Newcastle United signing a five-year deal, for a reported fee of £15 million, with Rémy Cabella going in the other direction to Marseille on a season-long deal, with an option to buy. Thauvin was handed the departing Cabella's number 20 shirt. He made his debut three days later, replacing compatriot Gabriel Obertan, in the 69th minute of a goalless draw against Manchester United at Old Trafford. He made his first start for the club against Northampton Town in the League Cup second round on 25 August, scoring a goal and making three assists in a 4–1 home victory. Thauvin was criticised by Newcastle's all-time top scorer Alan Shearer for turning up to a game wearing a tuxedo. In February 2016, he told L'Équipe that the criticism was unfair and affected his performances. On 31 January 2016, Newcastle announced Thauvin would return to Marseille on loan for the rest of the season. In the first game of his loan, on 2 February, he was sent off ten minutes after coming on as a substitute at Montpellier for a foul on Hilton. He scored the only goal on 20 April as they beat FC Sochaux-Montbéliard 1–0 away in the semi-finals to reach the final of the 2016 Coupe de France against Le Classique rivals Paris Saint-Germain, which they lost 4–2 with Thauvin scoring a goal. On 4 August 2016, Thauvin began his second loan spell at Marseille, signing a season-long loan deal; Newcastle inserted a clause in the contract which gave Marseille the option to make the deal permanent. In November 2016, it was reported that the loan spell would be made permanent in the summer of 2017, with Marseille agreeing to pay £9.8 million (€11m) for Thauvin’s permanent transfer once he had played just three matches for the club during his second loan spell. Thauvin captained Marseille for the first time in the 2016–17 Coupe de France round of 64 away match against Toulouse on 8 January 2017, which Marseille won 2–1. On 10 March, he scored two goals in the 3–0 Ligue 1 home win over Angers, taking his tally to four goals in his last four Ligue 1 matches. He was the UNFP Player of the Month for March, with three goals and two assists. On 30 April, Thauvin scored the first hat-trick of his senior club career and assisted one of Maxime Lopez's two goals in a 5–1 Ligue 1 away win over Caen. On 2 February 2018, Thauvin scored another hat-trick in a 6–3 home win over Metz. He won two more Player of the Month awards for November and February, and finished the 2017–18 Ligue 1 season with 22 goals, behind only PSG's Edinson Cavani for top scorer. He was one of four candidates for the Player of the Season award, that ultimately went to the Parisians' Neymar. In the season's Europa League, he contributed four goals in fourteen games for the team, who lost the final to Atlético Madrid in Lyon. Thauvin was a regular in the France national youth football team and represented them at the under-18, under-19, under-20 and under-21 levels. Thauvin was a member of the French squad which won the 2013 FIFA U-20 World Cup in Turkey. He scored a penalty in the 4–0 win over Uzbekistan in the quarter-finals and a brace in a 2–1 victory against Ghana in the semi-finals. Thauvin was called up to the senior France squad for the first time to face Luxembourg in a 2018 World Cup qualifying match on 25 March 2017 and Spain in a friendly three days later; he did not play in either match. 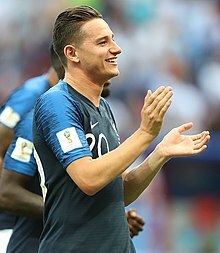 On 2 June 2017, Thauvin made his debut for Les Bleus in a 5–0 win over Paraguay, coming on in the 80th minute as a substitute for Antoine Griezmann. Thauvin was selected in the 23-man squad for the 2018 FIFA World Cup in Russia. He played one minute as Didier Deschamps' team won the tournament, in a 4–3 win over Argentina in the last 16 in Kazan in place of Kylian Mbappé. In January 2014, he was named by The Observer as one of the ten most promising young players in Europe. Former Toulouse manager Alain Casanova called Thauvin "a player in the image of Franck Ribéry … someone who is able to disrupt any opponent, someone very dangerous when he picks up speed. Very dangerous indeed." ESPN columnist Andy Brassell described him in 2013 as a wide player who is a "left-footer with fine acceleration and jaw-dropping close control." ^ "Profil of Florian Thauvin" (web). Olympic of Marseille. 19 October 2018. Retrieved 19 October 2018. ^ a b "Factfile: Florian Thauvin". Newcastle United. 19 August 2015. Retrieved 19 August 2015. ^ "Vannes v. Grenoble Match Report" (in French). Ligue de Football Professionnel. 8 April 2011. Retrieved 26 August 2011. ^ a b "Bastia: Florian Thauvin (Grenoble) a signé" (in French). Foot-National. 19 July 2011. Retrieved 26 August 2011. ^ "Bastia beat Bordeaux, Lorient deny Ajaccio". UEFA.com. 28 October 2012. Retrieved 28 October 2012. ^ a b c d e Marshall, Anthony (19 August 2015). "Thauvin Completes United Switch". Newcastle United F.C. Retrieved 19 August 2015. ^ "Deux prêts à Bastia". L'Equipe (in French). 30 January 2013. Retrieved 30 January 2013. ^ a b "IBRAHIMOVIC TAKES PLAYER OF YEAR GONG". Ligue 1. 20 May 2015. Retrieved 20 August 2015. ^ "Marseille clinches Thauvin deal". Goal.com. 2 September 2013. Retrieved 27 September 2014. ^ "Marseille out of French Cup after shootout defeat by fourth-tier Grenoble". The Guardian. Associated Press. 4 January 2015. Retrieved 5 March 2015. ^ Johnston, Neil (22 August 2015). "Man Utd 0-0 Newcastle". BBC Sport. Retrieved 24 August 2015. ^ "Newcastle 4-1 Northampton". BBC Sport. 25 August 2015. Retrieved 25 August 2015. ^ "Shearer singled me out with tuxedo criticism - Thauvin". FourFourTwo. 13 February 2016. Retrieved 26 November 2017. ^ Marshall, Anthony. "Thauvin Returns To Marseille On Loan". Newcastle United F.C. Retrieved 31 January 2016. ^ Richards, Alex (3 February 2016). "Newcastle flop Florian Thauvin makes Marseille return - and gets sent off after just 10 minutes". Daily Mirror. Retrieved 26 November 2017. ^ "Sochaux 0-1 Marseille". BBC Sport. 20 April 2016. Retrieved 23 April 2016. ^ Marshall, Anthony (4 August 2016). "Thauvin Returns To Marseille". Newcastle United F.C. Archived from the original on 4 August 2016. Retrieved 4 August 2016. ^ "Newcastle transfer already complete: Marseille to splash £9.8m on Florian Thauvin clause". Daily Express. 5 November 2016. ^ "Thauvin helps OM up to fifth". www.ligue1.com. 10 March 2017. ^ a b "Florian Thauvin et Baptiste Guillaume, joueurs du mois de Mars !". UNFP (in French). 11 April 2017. Retrieved 11 May 2017. ^ "Nice deals blow to PSG in French title race with 3-1 win". New York Daily News. Associated Press. 30 April 2017. Retrieved 1 May 2017. ^ "Thauvin hat trick keeps Marseille's European hopes alive". The Times of India. Associated Press. 30 April 2017. Retrieved 1 May 2017. ^ Granel, Cédric (2 February 2018). "l'OM explose Metz au Vélodrome et prend la 2e place provisoire" [OM blow Metz apart at the Vélodrome and take 2nd place for the time being] (in French). Eurosport. Retrieved 19 February 2018. ^ a b "Florian Thauvin et Umut Bozok, Novembre gagnant !". UNFP (in French). 12 December 2017. Retrieved 12 December 2017. ^ a b "Florian Thauvin et Dylan-Saint-Louis, joueurs du mois de Janvier!". UNFP (in French). 13 February 2018. Retrieved 13 February 2018. ^ a b "Neymar wins French league's Player of the Year award". Associated Press. 13 May 2018. Retrieved 3 September 2018. ^ "France 4-0 Uzbekistan". FIFA. Retrieved 27 September 2014. ^ "France 2-1 Ghana". FIFA. Retrieved 27 September 2014. ^ "Mbappé et Lemar sont là, pas Lacazette ni Benzema" (in French). sport24.com. 16 March 2017. Retrieved 16 March 2017. ^ "France vs. Paraguay - 2 June 2017 - Soccerway". soccerway.com. Retrieved 13 June 2017. ^ Benson, Michael (17 May 2018). "World Cup 2018: Chelsea, Manchester United and Manchester City stars included in France's squad for finals". Talksport. Retrieved 24 May 2018. ^ Jennings, Patrick (30 June 2018). "France 4–3 Argentina". BBC Sport. Retrieved 18 July 2018. ^ "The next 10 big things: Europe's top youngsters and stars of the future". The Observer. 18 January 2014. ^ Brassell, Andy (20 June 2013). "Under-20 stars ready to dazzle". ESPN FC. Retrieved 28 August 2013. ^ a b c "F. THAUVIN". Soccerway. Retrieved 20 August 2015. ^ a b "Florian Thauvin". Football Database.eu. Retrieved 28 August 2012. ^ "Florian Thauvin – national football team player". EU-Football.info. Retrieved 3 June 2017. Wikimedia Commons has media related to Florian Thauvin.